One thing that always manages to freak out my eco-sensibilities is gift wrapping. It’s really only used for such a short amount of time and then it’s in the bin!! This is an area where we can all make a big impact and use some eco-friendly alternatives, especially at Christmas time when we are wrapping up lots of gifts. Are you up for the challenge to reduce your paper waste?? First things first, hunt around the house to find stuff you already have that could be used. Save ribbons, twine, tags, cards, gift bags and paper throughout the year. Okay, I may be a bit lame but I actually have a dedicated box for all of these goodies I want to re-use! 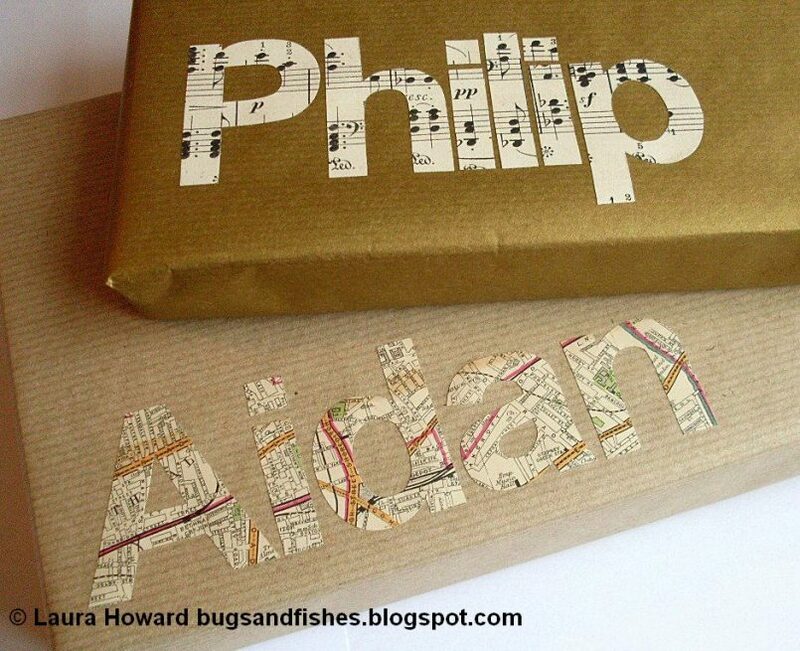 Check out these eco-friendly gift wrapping ideas. 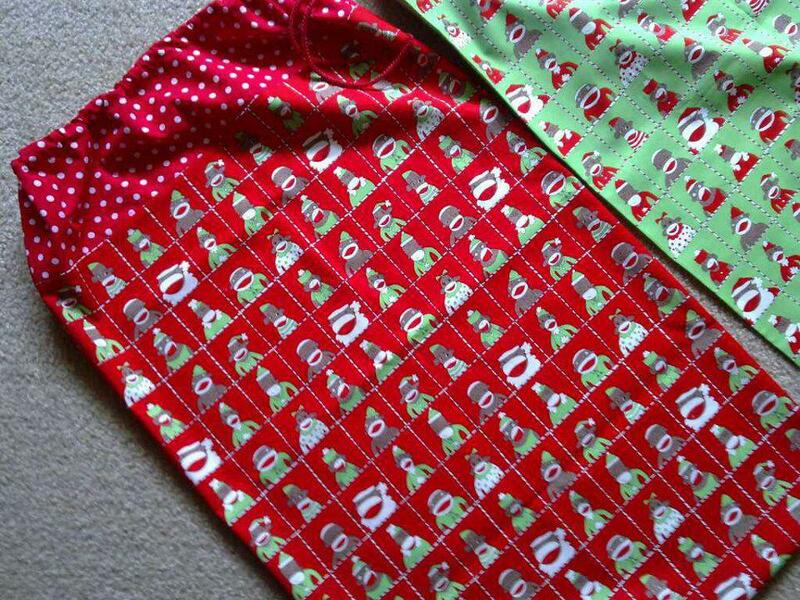 A few years ago, I got my friend to make up some santa sacks for hubby and I. The kids already had one each they had been given when they were little. They are so funky and it has cut our paper wastage enormously! On Christmas morning, we take it in turns to each take one gift out of the sack at a time. You can often find people selling santa sacks at the markets or check out Etsy. You can extend this idea to birthdays and make or buy a ‘birthday sack’ to use every year. We have a few cute fabric bags we keep for birthdays. 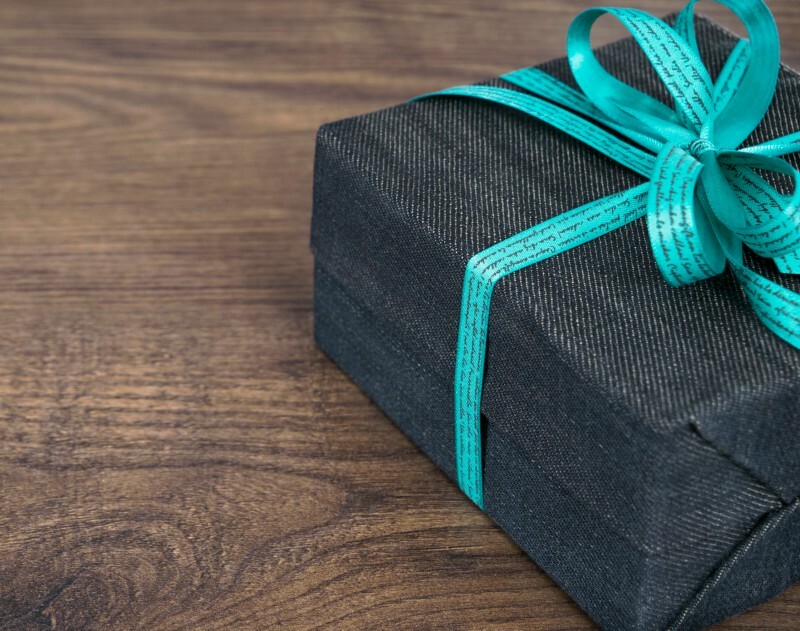 You will never have to wrap another gift again. Just take 3o seconds to put gifts in a bag. Done! 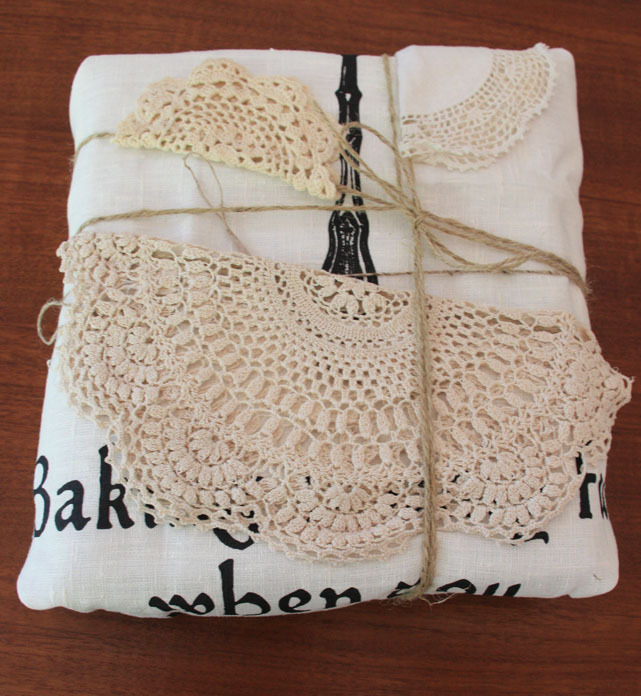 Wrap gifts in something reusable and useful, like a scarf, tea towel or doilies. Kookery shows you how to do it step by step. If you want to go extra eco-hero, choose items from the op-shop. If you want to get really fancy, check out how to do Furoshiki (the art of Japanese fabric wrapping) or just use a square of fabric or hessian for a really rustic look. You can upcycle old maps, sewing patterns, newspaper, brown paper, sheet music, old calendars, magazines, comics or kids’ artwork. You could also cover a cardboard box with any of these and use every year as a personalised Christmas or birthday box! What about getting the kids to make their own? Check out this gorgeous idea from Laura at Bugs and Fishes pictured above. Tres chic! I buy these a lot for gift giving. It’s really double the love as the reusable shopping bags will (hopefully) be used again and again. 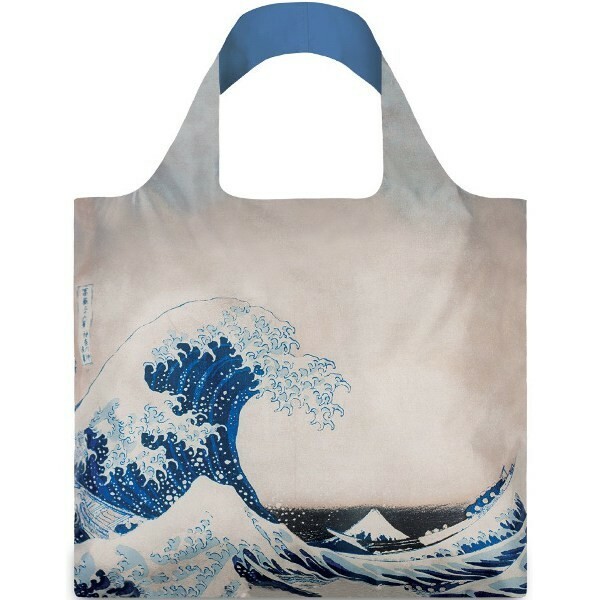 I particularly like these Loki fold up bags (pictured) that come in a beautiful range of arty prints, but also check out the op shops and stores selling calico bags too. The snack pockets, wraps and food bags from 4 My Earth also make an excellent eco-friendly gift wrap. 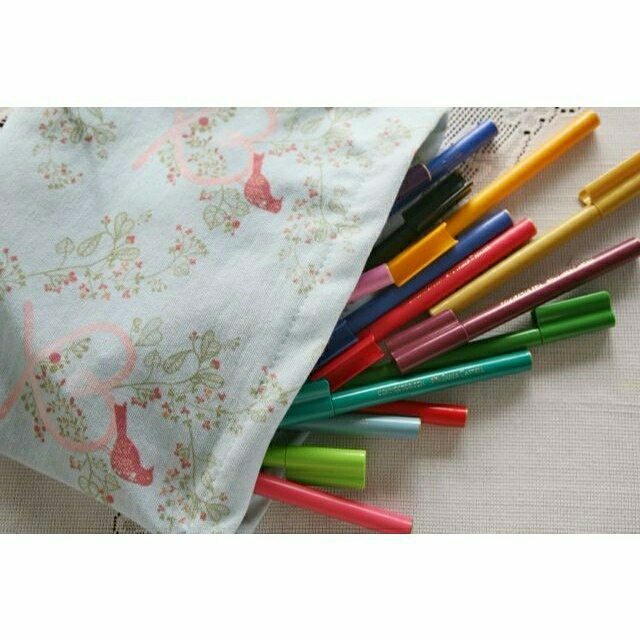 They can then be used in lunch boxes, for food storage, as a toiletries bag and so many other things. We have so many of these and we love them! Really, anything you can think of can be used to hold gifts. Head to the op shop and see what you can find. Pretty them up with ribbon, paint, twine and a few embellishments. Pinterest has loads of ideas for you. If you really love to use wrapping paper, choose one which is eco-friendly and recycled like the gorgeous ones at Earth Greetings. There are so many eco-friendly things you can use to trim gifts. I always save gorgeous ribbon and twine for reuse. Head outdoors and find some leaves, lavender stems, feathers, gum nuts, twigs, flowers, herbs, pine cones or shells. If you are crafty you could make some paper flowers or bows or upcycle Christmas ornaments. 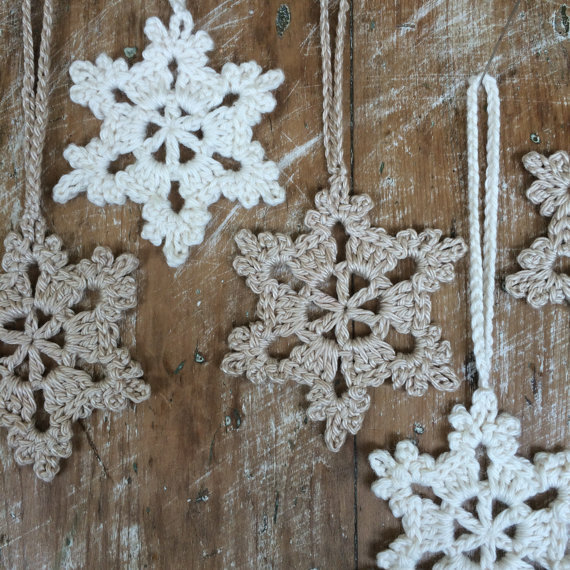 I really love these crochet decorations on Etsy – divine! I have even seen cute things like pencils, vintage cutlery, bamboo cutlery, photos, brooches, earrings and clothes pegs used to trim gifts. Gift tags can be as easy as upcycled cards from last year, cut down into shape or a piece of cardboard decorated with stamping or washi tape. I also adore these handmade clay tags from Brisbane artist Kylie Johnson. Ended up with wrapping paper? If you do end up with wrapping paper, recycle everything you can, keep it for next year or upcycle it into something new. Keep in mind that you can’t recycle plastic or foil wrapping paper so avoid that at all costs! What other tips do you have? Share with us! Be sure to note that just because paper rolls are brown, this does not mean they are recycled. Just means they might be unbleached. Look for 100% recycled (better yet, post consumer recycled) when buying brown paper rolls. Also, a few years ago, I visited spotlight after Christmas and bought up big on heavily discounted Christmas fabric, and just hemmed random sized squares and rectangles. Now I just use those to wrap our families Christmas presents, and for those presents that we are present for their opening, so that we can claim it back again for re-use. I’ve always offered it to people if they wanted to keep it, on the proviso that they reuse it as well, and while some haven’t, a few have, so it keeps on wrapping year after year. (I hold it all together with the ribbon tied around it). I am not buying presents, instead buying Oxfam cards, luckily I don’t have many to buy for and no kids to worry about. All great ideas here which can be used for any occasion, thanks for the inspirations. I use old photos for gift tags. My kids are too young to read yet, but they can find the right present for anyone because they just look for the right photo. Hi, I am going to use crochet pieces and put Lavender and wooden balls that have pure oil scents to give as presents this year with your gift wrapping tips. What a great idea. Have shared with all my great friends. Thanking you. And a Very Merry Christmas. Are you sure you cant recycle plastic wrapping paper? ? Wouldn’t that fall into the soft plastics recycle? ? With 5he bread bags plastic bags & froz veg bags?? ? using kinder art ? ?